On April 7, 2012, tragedy struck the 6 Northern Light Infantry's (6NLI) battalion headquarters camp at Giyari outpost at the snout of the Giyari glacier (which rises near the Bilafond La pass) situated at an altitude of 4000 metres on the western slopes of the Saltoro Range in the Gilgit-Baltistan province of Pakistan Occupied Kashmir (POK) killing 126 soldiers and 14 civilians by burying them under a massive 80 feet of snow over a spread of 1 Sq. Km. Just three bodies have been recovered after almost eight weeks of search and recovery operations with 450 rescuers on the job and with Gen. Kiyani mostly stationing himself there to oversee the operations personally. It was finally on May 29 that these 140 persons were declared dead as 'martyrs' (shuhada) by the Government of Pakistan. The Pakistani Army Spokesman Maj. Gen. Athar Abbas said in a briefing that over 3000 Pakistani soldiers have died in these desolate heights ever since c. 1984 when the Indian and Pakistani troops started confronting each other on these icy, dangerous and very high altitude mountain ridges and escarpments. During the same period, India has lost 950 soldiers according to Indian Defence Minister A.K.Antony in the Indian Parliament on May 1, 2012. Arguably, this is the highest battlefield in the world. In September, 2003 Pakistan proposed an informal ceasefire which has held since the. Since that time, India has significantly brought down its fatality rate. With better communication, better medical facilities, mobile hyperbaric chambers, better clothing, special equipment, quicker medevac and better transportation etc. India has reached a near-zero casualty rate. Of course while crevasses and avalanches lurk dangerously for the foot-soldiers, heavy downdraft winds and whiteouts are another matter for the helicopter pilots. Since c. 2006, the Indian Army has opened up the Siachen for a 22-day trekking tourism and adventure too. Ten days after the Giyari tragedy, the Chief of Army Staff (COAS) of the Pakistani Army (PA), Gen. Ashfaq Parvez Kayani spoke of demilitarization of Siachen. He spoke of the high cost and environmental impact as the reasons for such a demilitarization. He added, "Peaceful coexistence between the two neighbours is very important so that everybody can concentrate on the well-being of the people". Those words, coming from an ex-ISI chief who planned the 26/11/2008 Mumbai urban terror carnage, sound hollow. It is generally believed that India spends almost Rs. 50 million (5 Crores) a day to maintain its troops in this area while Pakistan is claimed to spend one-third of that daily. The Indian logistical support is through the costly aerial route for the extensive Indian deployment at higher altitudes while Pakistan, having the advantages of being located at fewer places, at lower heights and near inhabited places has a logistical advantage. So, why is Gen. Kayani suddenly awakening to the economics of the Siachen conflict ? That is because, they have lost a very important supply base at Giyari. Gen. Kayani wants to pre-empt any Indian military move to take advantage of the precarious Pakistani situation of having not only lost an important logistics base but also well-trained, experienced and hardened troops who could not be easily replaced in such large numbers quickly. The highest helipad in the world, Sonam (20997 ft), is maintained by India here. So, 'concentrating on the well-being of the people' rather than on this wasteful expenditure is no doubt a common-sense argument that one can immediately agree with. The Indian Minister of State (MoS) for Defence, Pallam Raju, welcomed Gen. Kayani's statement immediately. On April 30, Indian Defence Minister, A.K.Antony said, "12th round of Defence Secretary- level talks were held between India and Pakistan on May 30-31, 2011. It was agreed to continue the discussions in a meaningful and result-oriented manner", in a written reply. After visiting the area of tragedy, the former Prime Minister of Pakistan, Nawaz Sharif, went to the extent of saying that Pakistan must unilaterally withdraw its troops first and he felt that soon thereafter India would follow suit. Many analysts of Pakistan refer to Indian 'aggression' of Siachen, and they use the latest tragedy as an opportunity to propagate wrong history as usual. Newspapers in Pakistan and even many in India referred to the tragedy at Saltoro as a tragedy in Siachen itself and there were calls to withdraw troops from that region. Not that such tragedies are unlikely to occur (or have not occured) in Siachen proper, but a lack of knowledge of the topography of the region leads to this entire area being referred to as Siachen. Similarly, a lack of knowledge of events leading up to Operation Meghdoot that led to Indian troops occupying the Siachen and Saltoro heights in the first place is responsible for usage of terms such as 'aggression by India'. India and Pakistan have had 12 rounds of unsuccessful dialogue on this issue and the thirteenth is scheduled in Islamabad on June 11 & 12. It is therefore a good time to understand the issues involved. So, what is the story of Siachen ? An overview of the geography and topography of the region is in order before we look at geopolitical, military and strategic issues of this conflict. There are five significant mountain ranges in the J&K state and these are, from east to west, the Karakoram Range (400 miles long), the Ladakh Range, the Zanskar Range, the Great Himalayan Range and the Pir Panjal Range. Of course, there are numerous other minor mountain ranges that branch off these significant five, such as Deosai Mountains, Saltoro, and Baltoro to name a few. The Karakoram (meaning Black Gravel in Kyrgyz language) Range ends at the Pamir Knot in Central Asia. The sub-ranges of the main Karakoram Range are referred to as muztagh. Thus, for example, we have Siachen Muztagh, Rimo Muztagh and the Sasser Muztagh in the Eastern Karakoram lying to the east and south of the Siachen glacier. The Siachen Muztagh had been explored by the IA during the 1978 to 1981 period (see later for more information). Though these areas have been explored since early 1820s, serious exploration started only in the second half of the nineteenth century as the contours of the Great Game began to take shape. One of the pioneering explorers in the late nineteenth century was Maj. Francis Younghusband who led a British India army unit to capture Lhasa. While the Siachen had been earlier explored by various European expeditions, they all came over the Bilafond La pass in the west. The IA expedition of c. 1978 was the first to ascend it from the Nubra valley through the snout of the glacier. The Indian Army Engineers expedition climbed Rimo IV in 1984. By c. 1985, the IA had almost thoroughly explored the Rimo Muztagh. The Sasser Kangri in the Sasser Muztagh, which is south-east of Siachen, had been first climbed by the IA in 1973 itself. For full size picture, click here. It is also instructive to know some other salient geographical features. The Kashmir valley itself lies between the Great Himalayan Range and the PirPanjal Range. The Zoji La pass on the Great Himalayan Range gives an access from the Kashmir valley to Leh in Ladakh through Drass and Kargil. The Chorbat La pass on the Ladakh Range and on the CFL (now, the LoC skirts further north of the Chorbat La after the 1971 war) gives another access to the Shyok Valley to Piun and then to Skardu through Khapalu (the last two in POK. Khapalu is the Brigade HQ for PA's Siachen operations). The 75-Km long and, 1000 feet deep, on an average, 4.5 Km wide (between 2 Kms & 8 Kms at different points) Siachen (meaning, "a place of roses' in Balti) Glacier, the second largest outside of the two polar regions, is situated on the eastern Karakoram Range, buffeted between the Saltoro Range in the South and West and the main Karakoram to the East. The glacier runs diagonally from southeast to northwest. The Saltoro Range, whose northernmost tip is Sia Kangri (7422m) at less than 5 Kms north of Indira Col (which incidentally is the northernmost point of India today), is nearly 85 Kms long and lies 15 to 20 Kms to the west of the Siachen Glacier. A few kilometres to the east of the easternmost tip of this glaciated region is the strategically important and all-weather Karakoram Pass (5540m) which has been part of the centuries-old Silk Road to Yarkand and beyond. It is near the Karakoram Pass that the world's highest airfield, Daulat Beg Oldie, is located on the Indian side. Karakoram Pass can be reached from Nubra Valley through Sasser Pass and Daulat Beg Oldie. A few kilometres to the east of the Karakoram Pass begins the Aksai Chin area that China illegally occupied from India in c. 1962. Up North of the Siachen Glacier is the Baltoro Glacier right under the second highest mountain peak in the world, known as K2 or Mount Godwin-Austin. This is close to the ~6000 Sq. Km. Shaksgam Valley (China & Pakistan refer to this area as Trans Karakoram Tract to fudge the historic significance of this area to the state of Jammu & Kashmir) that Pakistan ceded to China in c. 1963 to enable it to construct the Karakoram Highway from Kashgar to Pakistan. The Turkestan La pass from Siachen open into the Shaksgam Valley. Earlier, China had also constructed its National Highway No. 219 whose construction started in c. 1951 as soon as Communist China forcibly established its suzerainty over Tibet . This Highway connected Tibet and Sinkiang (now Xinjiang) surreptitiously through India's Aksai Chin (a length of 230 Kms). In a note to Government of India, the Chinese said, "The Aksai Chin area has always been China's territory; it is the communication artery linking Sinkiang and the Ari District in Tibet of China and has always been under the jurisdiction of the Chinese Government; both in law and fact there is no room for dispute about China's sovereignty over this area." In fact, Pakistan's cartographic aggression and authorizing of foreign mountaineering expeditions was a similar fait-accompli that India wanted not to repeat when it decided to take action. India's fears were confirmed when intelligence (and even a note from a Pakistani Brigadier to his Indian counterpart) also confirmed it. Further north of the Baltoro is the Rakaposhi Range and then the famous Khunjerab Pass through which the Karakoram Highway reaches Pakistan from China. For these reasons, Siachen is also refrred to as the tri-junction of India, China and Pakistan. The northern-most point of the Siachen Glacier is the Indira Col (or Indira Pass which is named after the Indian Goddess Lakshmi by one of the earliest explorers, the Workman couple in c. 1911 and has nothing to do with Mrs. Indira Gandhi). On the eastern side of the Siachen Glacier are other peaks of the Karakoram (in a west-to-east direction) such as Singhi Kangri (7202m, 'kangri' meaning peak in Balti language), Teram Kangri (7407m), and the Apsarasas Kangri (7236m), The famous Nubra river, among others, originates in the Siachen Glacier at the snout of the glacier near a place called Dzingrulma (where the road to Siachen ends and where India's base camp is located) and joins the Shyok River which itself then drains into the Indus near Skardu in the Baltistan region of Pakistan Occupied Kashmir (POK). The Shyok itself originates from the Rimo Glacier that is connected to the Siachen Glacier through the Teram-Shehr glacier. On the road from Leh to the Nubra Valley is located the Khardung La (Ladakh Range) pass at 18400 ft. and claimed to be the second highest motorable road in the world. Further to the east of Khardung La is the Chorbat La pass which gives an easier access to the northern Shyok Valley and further to Skardu. Overall, this region is reputed to have over 150 glaciers and is also sometimes referred to as the third pole. Siachen cannot be looked at in isolation or as a conflict between India and Pakistan alone. India's strategic decisions must be taken in the context also of the boundary dispute between India and China and the developing nexus (since at least c. 1962) between Pakistan and China in the Gilgit-Baltistan (GB) area. After the 1947-48 war ended due to India taking the issue to the United Nations, the Army commanders of both sides met in Karachi in 1949 to delineate the Ceasrfire Line (CFL). They could precisely delineate the CFL only upto a certain map-grid point, known as Khor or NJ980420. This is a point approximately mid-way between the Nubra and the Shyok rivers between the Ladakh and the Saltoro Ranges and at the southern end of the Saltoro range. The military commanders agreed that the CFL would run "thence north to the glaciers". The Annexure 26 of the UN Commission for India and Pakistan (UNCIP) Report dated July 29, 1949, available here, states the following in Paragraph (B)(2)(d) in Part II titled 'Agreement': From Dalunang eastwards the cease-fire line will follow the general line point 15495, Ishman, Manus, Gangam, Gunderman, Point 13620, Funkar (Point 17628), Marmak, Natsara, Shangruti (Point 1,531), Chorbat La (Point 16700), Chalunka (on the Shyok River), Khor, thence north to the glaciers. This portion of the cease- fire line shall be demarcated in detail on the basis of the factual position as of 27 July, 1949, by the local commanders assisted by United Nations military observers. It is interesting to note that the Karachi agreement cited above was signed by Lt. Gen Shrinagesh while it was signed by Maj. Gen. J. Cawthorn on behalf of the Pakistani Government. Maj. Gen. J. Cawthorn, a British Army officer of Australian descent, was responsible for effectively setting up the notorious ISID (though he was only its second Director General). He articulated Pakistani positions as to why the state of J&K must be merged with Pakistan in various fora. It is also interesting to note that another prominent member of the Indian team at Karachi drafting this document was Brig. S.H.F.J. Manekshaw (later Field Marshal) who played a very key role in the accession of and later military operations in J&K during 1947-1948. From even a cursory glance of the maps, one can see that this would then encompass the Siachen Glaciers. During the 1962 India-China war, the US Department of Defense (DoD) offered the services of the USAF pilots to ferry Indian troops to and from the Aksai Chin area, an area that needed overflying the Siachen Glaciers. A few years later, in c. 1967, the Defense Mapping Agency (DMA) of the DoD produced maps known as Tactical Pilotage Charts (TPCs) that indicated the CFL running from Point NJ980420 to the Karakoram Pass (KKP) which is to the east of the Siachen Glaciers. After the 1971 Bangladesh War, the CFL nomenclature had been changed to LoC (Line of Control) as per the Shimla Agreement of 1972 between India and Pakistan. Yet, the LoC remained undemarcated after Point NJ9842. 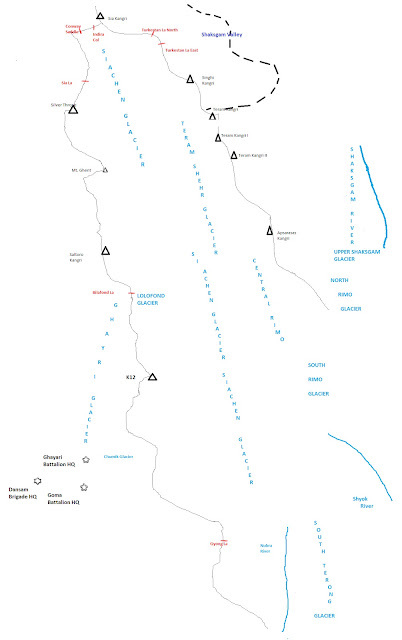 Pakistan began to interpret the term, "thence north to the glaciers" as "thence North East to the Karakoram Pass" while India correctly interpreted that as "thence north (along internationally accepted practice of ridgelines and watersheds forming boundaries between territories) to Indira Col". In the case of river boundaries too, the mid-channel marker (known as thalweg or the deepest water in a stream) is the principle for demarcation. In the Sir-creek issue too, Pakistan is demanding the eastern bank (the Indian side) to be used as the boundary rather than the mid-channel. International boundaries between adjacent countries are not drawn as straight lines when ridges, rivers and watersheds constitute the borderlands. Air Commodore Jasjit Singh has argued that any compromise on the watershed principle could adversely affect India in the resolution of the India-China border issue. The adjustment of borders between Pakistan and China at this crucial tri-junction has to be also taken into account. Since the border had not been demarcated between British India and China in this area, Pakistan also had a border dispute with the communist China after its independence. Pakistan had made no progress at all with the Chinese in the border talks up until December 1962, by which time the India-China war had concluded with China having decisively dealt a blow to Indian military. The talks which started in Beijing in May, 1962 had stalled immediately because neither side had any legal records to claim their border alignment. Later, when the talks resumed in Pakistan this time on October 12, 1962, Ayub Khan records in his book, Friends not Masters, how the Chinese were ‘very difficult’ by claiming several areas on the Pakistan side including the Khunjerab Valley and the K-2 mountain peak. The Indo-China War was still more than a week away, October 20, 1962. After the India-China war ended abruptly on November 20, 1962, the Pakistanis were able to immediately find an innovative solution to their vexatious border problem with the Chinese based on the principle of using the watershed of the Indus basin rivers and the traditional grazing grounds used by the Hunza shepherds. Thus, Pakistan conceded vast portions to China, including the Shaksgam Valley. The Official Pakistan Map of 1962 in this area included 11000 Sq. Miles of territory (to the north of the ‘Traditional Frontier’)which has been totally lost by Pakistan to China. Pakistan never staked its claim to these areas in c. 1962, choosing rather to go by the 'Traditional Frontier' several hundred Kms. to the South of the Official Frontier. This is the area bordering Xinjiang (Sinkiang) where the British had built a road all the way from Gilgit in Hunza to Kashgar in Sinkiang where they had a Consulate. In addition, Pakistan conceded another about 3200 Sq. Miles to the south of the ‘Traditional Frontier’ to arrive at the new boundary alignment (out of the 3700 Sq. Miles claimed by China, it was ‘gracious’ enough to give 500 Sq. Miles of cattle grazing ground to Pakistan). It was on April 13, 1984, almost 28 years to the day before the latest Gyari avalanche disaster, that India launched Operation Meghdoot in an audacious and daring operation very reminiscent of Operation Duck to rid the 3500m. high Zoji La pass of the Pakistani intruders and save Ladakh from falling into Pakistani hands in c. 1948. In c. 1983, India has intelligence information that Pakistan had assembled a special group, the Burzil Force, to capture Saltoro and Siachen beyond that. In fact, a protest note from the Pakistani FCNA (Force Commander Northern Area) to his Indian counterpart on August 16, 1983 had claimed that Indian territory extended in this sector only up to the Karakoram Pass. This followed the citing of some troops of Indian Army's Ladakh Scouts on the glacier by the SSG troops of the PA. Based on this protest note and the intelligence, the IA came to the conclusion that the only way to thwart this aggression would be to occupy the heights and the passes on the Saltoro and thus was Op. Meghdoot planned. We now know from the accounts of Lt. Gen. Jahan Dad Khan, the then Corps Commander of the Rawalpindi-based X Corps of the PA (through his book, 'Pakistan Leadership Challenges', Oxford University Press, 08 July 1999) which was responsible for Force Command Northern Areas (FCNA) responsible for this sector, that the PA was preparing to seize Saltoro and Siachen in 1984 and the operation had been cleared at the highest levels. By c. 1983, Pakistan had access to nuclear weapons, thanks to Chinese proliferation, and they were emboldened to launch this adventure in Saltoro. Pakistan's use of terrorism against India under a nuclear overhang, in the Indian Punjab, the state of J&K and later all over India and even Indian interests abroad bear out the truth that Pakistan's proposed military action in c. 1984 in the Saltoro/Siachen area was indeed on the back of newly acquired nuclear weapons. The last major PA assault on Indian positions on the Saltoro ridge happened way back in c. 1992. It was, like all previous assaults, unsuccessful. It was in April 1987 that the SSG Commandos of the PA occupied a position overlooking the Bilafond La pass. This poistion was called the 'Quaid Post' by the PA. On June 25, 1987, the IA overran the Quaid Post and evicted the PA, an operation in which Bana Singh was given the highest award of Param Vir Chakra (PVC). In September, 1987, a certain Brig. Musharraf of the SSG attempted to capture certain salients in Bilafond La. It was a terrible disaster when a few hundred Pakistani soldiers died and a very hurt Musharraf decided to avenge it in c. 1999 when he launched an even more disastrous Kargil operation. In March 1989, Pakistan made another attempt through the Chumik glacier (near the now extinct Giyari base) but even that could not succeed. However, the Indian and Pakistani army commanders came to an understanding after this incident that neither side would occupy the difficult heights of the Chumik and this has been respected ever since. In November, 1992, the FCNA Maj. Gen. Zahir-ul-Islam Abbassi authorized another operation. This atempt led to the death of dozens of PA soldiers, as a result of which, Maj. Gen. Abbassi was stripped of his post by the then COAS, Gen. Asif Nawaz Janjua. As an aside, Gen, Abbassi later tried in September 1995 to stage a military coup with the help of the noted terrorist Qari Saifullah Akhtar of Harkat-ul-Jihadi-Islami (HuJI). After serving a minimum sentence, he was released in c. 1999 by Gen. Musharraf when he usurped power from Nawaz Sharif. Abbassi then joined Sipah-e-Sahab Pakistan (SSP) to work tirelessly for establishing a Caliphate. The target was a vulnerable section of the Dras-Kargil Road, whose blocking would virtually cut off the crucial life-line which carried the bulk of supplies needed for daily consumption as well as annual winterstocking in the Leh-Siachen sector. He [Lt. Gen. Mahmud Ahmed, GOC, X Corps and later to become the Chief of the ISI until he was relieved of his post for being a double-agent of the Afghan Taliban & Al-Qaeda. He has many other credits as well. He allowed Ahmed Al-Khadir, who bombed the Egyptian Embassy in Islamabad in November, 1995 to escape from a safe house with the help of the Taliban in Peshawar; wire-transferred USD 100,000 to the WTC terrorist Mohammed Atta through terrorist Ahmed Omar Saeed Sheikh; he was tasked by the US to talk to the Taliban to hand-over Osama bin Laden but instead, he asked them to resist the US; he was a part of the 'Gang of Four' who brought Gen. Musharraf to power ousting Nawaz Sharif ] was very hopeful that this stratagem could choke off the Indians in the vital sector for up to a month, after which the monsoons would prevent vehicular movement (due to landslides) and, also suspend all airlift by the IAF. “Come October, we shall walk in to Siachen – to mop up the dead bodies of hundreds of Indians left hungry, out in the cold,” he succinctly summed up what appeared to be a new dimension to the Siachen dispute. Circumstantial evidence such as the eleven attempts made by the PA to capture ridgelines and salients in the Saltoro Range in c. 1998 also add to the evidence. Accompanying his Prime Minister Nawaz Sharif for talks with the British Prime Minister Tony Blair on the Kargil situation, he said, "Pakistan has agreed to request and appeal to the freedom fighters to withdraw from Kargil if India also agrees to vacate the areas that it occupied on the LoC after the signing of the Simla Agreement." India uses helicopters such as the Cheetah, ALH Dhruv Mark IIIs or even the much bigger MI-17 VIs (which can now fly upto 18000 ft.) for logistics from the base camp to the various posts dotting the Siachen and the Saltoro. The supply line starts from Chandigarh to the Thoise airbase ('Thoise' is an acronym that stands for Transit Holding Of Indian Soldiers Establishment) in the Shyok Valley. Thoise falls under the Partapur sector of the Indian Army. The supply line employs the giant IL-76s, AN-32s, MI-17s, the Dhruvs and the ubiquitous Cheetahs at different stages. Why does the Indian Army distrust the PA ? In December 1948, India vacated the pickets on the important Haji Pir Pass that connects Punch and Uri. The PA promptly occupied them even as the Cease Fire went into effect from Jan 1, 1949. It was with great difficulty and a lot of sacrifices that the IA re-took the Haji Pir Pass in the 1965 war but in the talks in Tashkent, India returned it to Pakistan. In Kargil and other areas which are clearly delineated and agreed to by both the parties after the 1971 war, the IA has been withdrawing pickets during the winter since c. 1982 and in c. 1998, the PA surreptitiously occupied all the vacated heights prompting a bloody war. Even galciated salients in the Kargil sector which IA commanders assumed that the PA would not occupy were found to have been occupied. Now, China says that in order to celebrate the 'long-term friendship with Pakistan', they will be sending an expedition to the Boltoro glacier in June/July timeframe. It is therefore inconceivable for the IA to vacate the Saltoro and Siachen posts, especially when China's People's Liberation Army (PLA) has begun to be present in large numbers in Balawaristan after c. 2008, hoping that the invidious and perfidious PA would somehow abide by any agreement that may be arrived at authenticating the ground position. This is especially important considering the fact that in the negotiations in c. 2011, the Pakistani Defence Ministry representatives pushed India to include Chinese representatives in the discussion because China was controlling the nearby Shaksgam Valley. What do the protagonists of de-militarization say ? Certainly, Siachen cannot be the 'low-hanging fruit' to be plucked first before attempting to resolve the weightier issues. With border delineation between India and China not yet resolved after sixty years of negotiations (and a war), with Pakistan ceding an important area of Kashmir (the Shaksgam Valley abutting the Siachen glacier in the north) illegally to China, with increasing presence of the Chinese PLA troops in the sensitive Gilgit-Baltistan area, with the expressed desire of the PLA to come to the Baltoro glacier abutting the northern Siachen on the west, with Pakistan claiming the Indian border to end at the Karakoram pass citing the 1963 Pakistan-China agreement thus establishing clearly a collusion between these two nations in map and border making at the cost of India, and with the knowledge of the Pakistani propensity to be fraudulent and completely untrustworthy, the Siachen cannot be a 'low-hanging fruit' at least from an Indian perspective. After all, the entire state of Jammu & Kashmir as it existed on October 26, 1947 belongs to India. Then, why should India negotiate separately for Siachen alone ? It may or may not be. I do not know this for a fact one way or another. The biggest contributors to global warming are the Western powers, especially the USA, which also seems to be at the forefront of blunting Indian military advantage in Saltoro. It has been the US which in the last sixty years of its reckless support for a state like Pakistan, has brought the whole world to the brink of disaster. The Siachen impact on ecology, even if it were to be true, pales into insignificance in comparison to Pakistan's jihadi terrorism and nuclear proliferation and the US' support for these two activities since at least the 1970s. As noted elsewhere in this blog, there is no fail-safe and fool-proof technology available to monitor troop movements in these areas. Those who occupy the peaks, salients, passes will dictate terms. India enjoys an enormous advantage here, thanks to the sacrifices of thousands of its brave soldiers over nearly 30 years and the brilliant mountaineering expeditions of a group of dedicated army officers and rank & file in the 70s and the 80s. The Siachen conflict is a cruel, costly and unnecessary war that must be brought to an end. not cruel, costly or justified ? What do the Pakistanis say ? Pakistan cannot authenticate any AGPL because it was India that aggressed and should not have been where it is now. This is a hollow argument for two reasons. One, Pakistan and its Cold-war ally, the USA, had already committed cartographic aggression by depicting in the maps that the Siachen area belonged to Pakistan. Further, Pakistan had made all preparations to mount a military assault on Saltoro and Siachen in c. 1984. India got wind of the impending action and simply pre-empted them by a few days. The local Pakistani commander was waiting for a warmer weather according to Shuja Nawaz, the brother of ex-Pakistani COAS, Gen. Asif Nawaz Janjua, in his book, 'Crossed Swords'. As already noted, the Rawalpindi Corps Commander of c. 1983, Lt. Gen. Jahan Dad Khan has written how an operation similar to Op. Meghdoot had been planned by the PA for May 1984. The IA simply staved off Pakistani aggression on Indian territory and cannot therefore be equated to aggression. Pakistanis also refer to India unilaterally altering the LoC in Siachen, thus violating the Simla Agreement. Pakistan cannot put on this face of 'injured innocence' in light of its designs on this area since long, first by trying to create a fait-accompli by 'authorizing' mountaineering expeditions from Europe, Japan and Australia, later by altering maps, then by trying to send its army patrols in this area and finally planning to capture it through force in May 1984. There is no reference to "thence north to the glaciers" in the 1972 Shimla Agreement. Though the wordings appear to be unfortunate, we will shortly see why the seeming contradiction is not really one. Even the 1965 Tashkent Agreement does not refer to "thence north to the glaciers" because the troops were agreed to be withdrawn to the CFL determined by the 1949 CFL. It therefore firmly recognized the agreement reached in Karachi in 1949. However, after the 1971 war on the western front, the two sides decided to retain whatever areas they captured. This resulted finally in the CFL being re-designated as LoC and a new alignment to the east of NJ9842. The Simla Agreement refers to the new Indian Position of Thang from where the LoC does run eastwards to NJ9842. This was what the Shimla Agreement meant when it said 'eastwards'. However, there was never any doubt about the termination point of NJ9842 because it was well recognized and accepted. There was no fighting to the east or north of Pt. NJ9842 in 1971 and therefore the question of not respecting the then existing CFL (Cease Fire Line resulting from the 1949 Karachi Agreement) beyond NJ9842 or altering it in these areas beyond that point simply does not arise. ". . . in Jammu and Kashmir, the Line of Control resulting from the ceasefire of December 17, 1971, shall be respected by both sides without prejudice to the recognised position of either side. Neither side shall seek to alter it unilaterally, irrespective of mutual differences and legal interpretations. Both sides further undertake to refrain from the threat or the use of force in violation of this Line." We now know that India only pre-empted the Pakistani aggression by a mere three or four days, as acknowledged by Pakistani Army officers themselves. Therefore, the claimed Pakistani high-moral-ground is humbug and hollow. No exchange of territory that could give India a strategic or tactical advantage in future conflicts. Shuja Nawaz says in his book that this did not look like 'an army that had just lost a war. It sounded more like the terms of surrender offered to a defeated enemy'. Besides, there has been no question about Nubra Valley and a part of the Shyok Valley being naturally part of the Ladakh region. India reneged on the Siachen Agreement. Pakistan agreed to mutually agreed re-deployment positions of troops but they insisted the troops to be re-deployed to their 1971 ceasefire positions and wanted delimitation of the LoC beyond NJ9842 through talks and not based on ground realities. The above is a vague statement running a middle line through the stands of the two governments. Pakistan is simply latching on to the third word in the above statement, namely, 'agreement' to claim as though there was an agreement. When Pakistan speaks of India reneging on a non-existent agreement, one is only reminded of Pakistani behavior in the light of UNSC resolution asking Pakistan to vacate J&K, its agreement in May 1948 to pay seignorage charges to India for waters through headworks in India and its immediate default, its non-settlement of partition dues to India till date, its repudiation of LoC during the Kargil conflict, its frequent violation of the 1972 Simla Agreement in various forms including sponsoring terrorism against India, its perfidious actions against the UNSC sanctioned terrorist Hafeez Saeed etc. Such is Pakistan's reputation that when it speaks of another country violating an agreement, it would not be taken seriously. Pakistan's "Joining two authentic points i.e. Pt NJ 9842 and KKP, duly recorded in international agreements since 1949 and 1963" and "numerous books and atlases as far back as 1965" record them and therefore cannot be 'cartographic aggression'. The 1949 agreement is presumably the Karachi agreement and it beats one's credulity when somebody claims that 'thence north to the glaciers' is equivalent to 'thence south-east to Karakoram Pass". The 1963 agreement is between Pakistan and China, who partook Indian territory and therefore by no stretch of imagination, even by Pakistani standards, can it be called an international agreement authenticating Pakistani position. Such an agreement does not bind India and India does not recognize this agreement. It is a circular argument by Pakistan to refer to maps and its bilateral treaty with China in its territorial disputes with India. In fact, such references1963 China-Pakistan Boundary Agreement only buttress the Indian stand of not withdrawing from Siachen at all, When India and Pakistan themselves had not demarcated a portion of their border, how can map makers sitting in Europe and the US decide on it and how can that be binding on India ?